NASA's Kepler satellite pointed to a patch of sky covering 116 square degrees in the constellations Cygnus and Lyra between May 2009 and April 2013. At any one time Kepler was able to obtain photometry of over 150,000 stars. For the vast majority of these sources, the effective exposure time per data point was 30 minutes. However, for a much more limited number of stars (512) a shorter effective exposure of 1 minute is possible. To study compact objects such as pulsating white dwarfs using Kepler, such exposure time observations are essential. Before the launch of Kepler, an extensive programme to identify bright G/K dwarfs with minimial stellar activity was carried out by various groups internationally. Although a small number of photometric variability surveys were carried out pre-launch they were either not especially deep, did not have wide sky coverage or did not have a cadence shorter than a few minutes. To fill this gap a team of astronomers started a photometric variability survey (RATS-Kepler) in the summer of 2011 using the Wide Field Camera (WFC) on the Isaac Newton Telescope (INT). RATS-Kepler is complementary to the Kepler-INT-Survey (ING web news release 8 Aug 2012). They made a series of 20 second exposures in the Sloan g band using the WFC which lasted for ~1 hour per pointing. The survey covered 42% of the Kepler field of view and they have obtained light curves for 7.1×105 objects in the range 13<g'<20. More than 100 strongly variable sources have been discovered. As a service to the wider community, the data products and cleaned CCD images are available to download (http://star.arm.ac.uk/rats-kepler/). 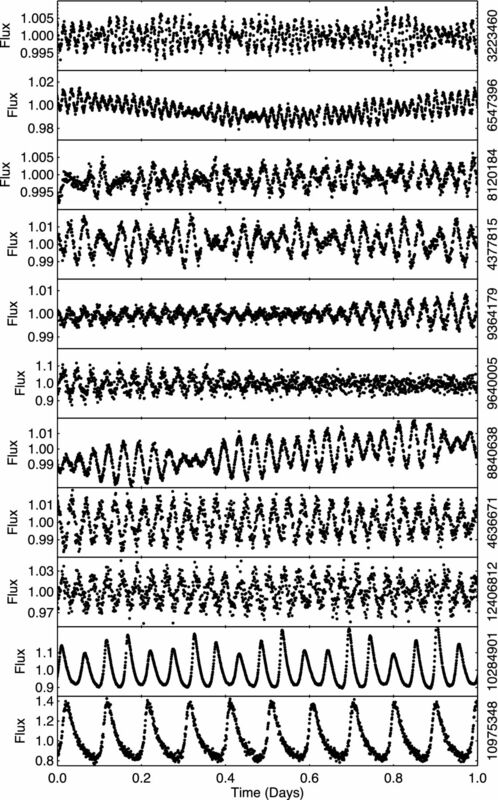 A short section of Q14 Kepler data of KIC 5623923. The binary component which is obscured during the secondary eclipse shows clear evidence of pulsations. Figure extracted from Ramsay et al., 2014, MNRAS, 437, 132. [ JPEG ]. The team obtained Kepler data in 1 minute exposure mode of 18 sources which were found to be variable in our survey and they give an overview of the currently available data in Ramsay et al., 2014, MNRAS, 437, 132. These sources include a pulsating DA white dwarf, eleven δ Sct stars which have dominant pulsation periods in the range 24 min to 2.35 hrs, three contact binaries, and a cataclysmic variable (V363 Lyr). One of the δ Sct stars (KIC 5623923) is in a contact binary (see the light curve above). 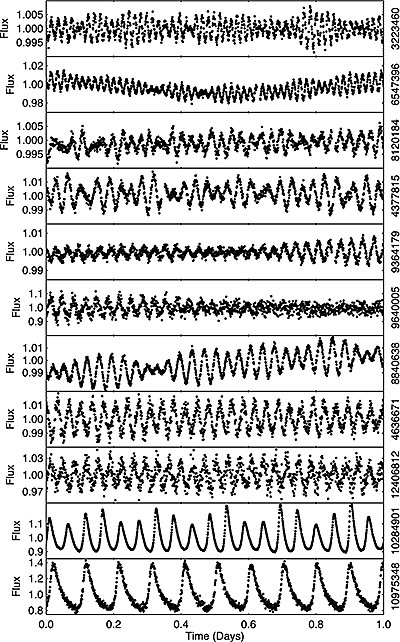 The Kepler short-cadence light curves of the 11 sources which appear to be δ Sct type stars. They are ordered so that those showing the shortest dominant period are at the top of the figure. For clarity, we show the light curve covering only one day for each star. The KIC identifier for each star is shown on the right-hand edge of each panel. Figure extracted from Ramsay et al., 2014, MNRAS, 437, 132. [ JPEG ]. Gavin Ramsay, Adam Brooks, Pasi Hakala, Thomas Barclay, David Garcia-Alvarez, Victoria Antoci, Sandra Greiss, Martin Still, Danny Steeghs, Boris Gaensicke and Mark Reynolds, 2014, "RATS-Kepler – a deep high-cadence survey of the Kepler field", MNRAS, 437, 132. Paper.